Now accepting dogs! 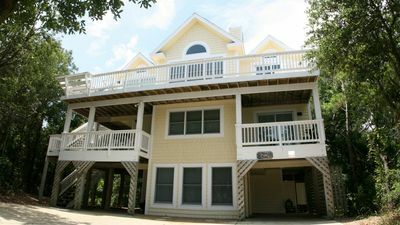 Coral Reef Treat offers a fabulous family retreat that will indulge you in the ultimate Outer Banks experience. And you are welcome to bring the family dog on your beach vacation. Your family will have memories to cherish for years to come. 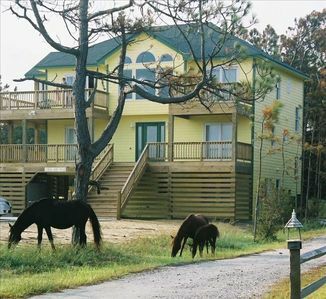 Relax on one of our covered decks or the ocean facing screen porch, lounge by the pool or take the short walk to one of the cleanest and most beautiful stretches of beach, close to the National Reserve land where the famous wild horses abound. Occasionally the wild horses escape the bounds of the reserve and find there way to the front yard as shown in the picture. 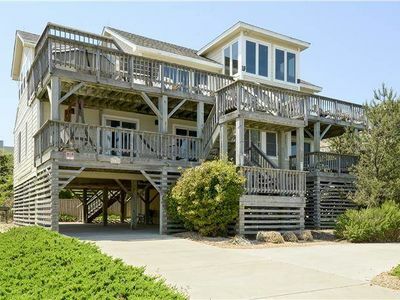 This home has been lovingly and meticulously designed for all the comforts of home to make your vacation relaxing and peaceful. 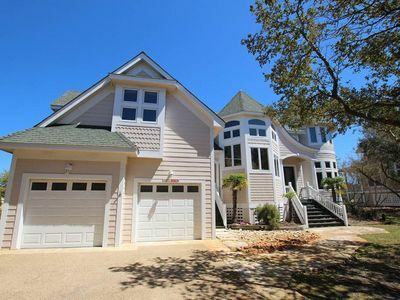 It is set on a half acre lot with a full size volleyball court, a basketball half court in the front of the house and parking spaces for 7-8 vehicles. 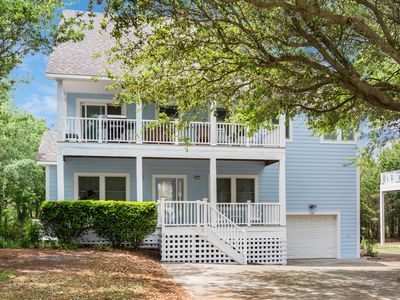 This home features a large great room and spacious gourmet kitchen with cathedral ceilings and plenty of large windows to view the surrounding natural beauty. The spacious kitchen is well stocked, beautifully laid out with 2 dishwashers and 2 full size sinks. 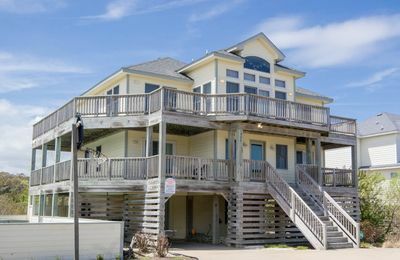 The three master bedrooms (3 kings with attached bath), plus four additional bedrooms with sleeping for sixteen, make this a perfect vacation home for 3 to 4 families. There is a lower level recreation room with a full size pool table and foos ball table, spectator chairs/ table, wet bar with freestanding ice maker, microwave and TV/DVD and stereo system with outdoor speakers. All conveniently located off the pool deck to make snacking and drinks close by. 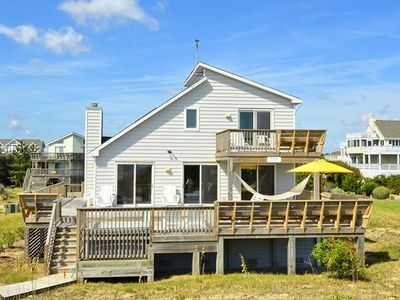 The extensive decking affords many seating areas, including a hammock on the mid-level deck and Adirondack chairs on the top deck for watching spectacular sunsets. 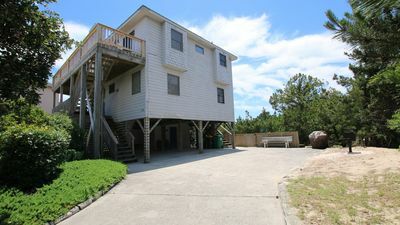 This spacious home offers lots of room for privacy! 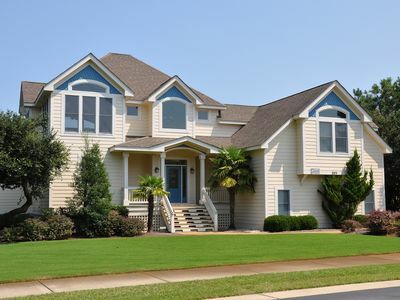 The back of the house welcomes you with a large 14x36’ pool and a 6-8 person spa. The pool deck, located just off the recreation room, has 4 cushioned lounge chairs, 2-tables, 8-chairs and 4-10’ market umbrellas (not shown in the picutures). Beach equipment and bikes are provided in an outdoor guest shed, including a Rolleze Beach cart to help with taking all the necessities to the beach. Bikes, Beach chairs, umbrellas and beach cart are provided for your convenience. 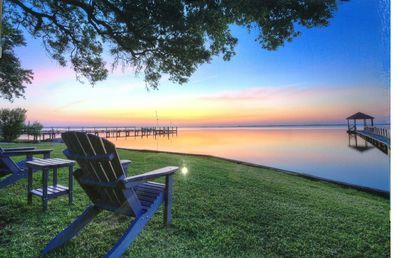 We offer numerous extras to make your stay comfortable. The house is supplied with bath linens for each guest and beds made upon arrival. 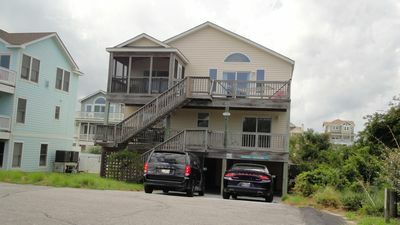 There are 2 HD color TVs, 7 color TVs, 1 Blue Ray, 4 DVDs, 2 stereos, surround sound and outdoor speakers along with internet access and free long distance calls within the continental US. Shopping: Timbucktoo Shopping Center; 10 minutes, 60 unique shops and restaurants for your enjoyment. Scarborough Faire; 20 minutes in Duck, specialty shops and restaurants. 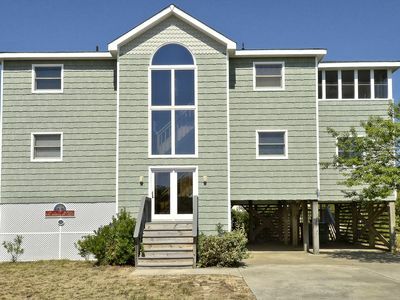 Corolla Village Shoppes; rentals of all types, restaurants, Food Lion supermarket. Country store, pizza and deli very close by. 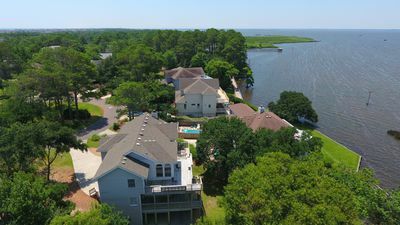 Golf: Currituck Club, 15 minutes, championship golf course/club. Duck Woods Country Club, semi-private. The Point Country Club, public, very nice course. The Carolina Club, public, very nice course, mini golf, 5 minutes. 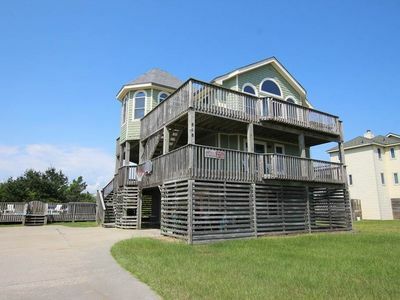 OCEANFRONT OASIS! 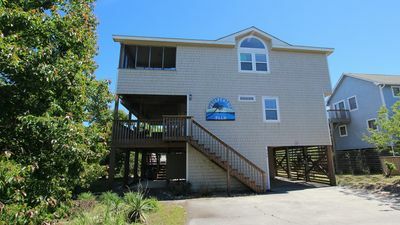 FEATURING 3 BEDROOMS, WIFI, SUPER OCEAN VIEWS AND HOT TUB!! OCEANSIDE! Private Saltwater Pool! Hot Tub! 600 ft to beach! 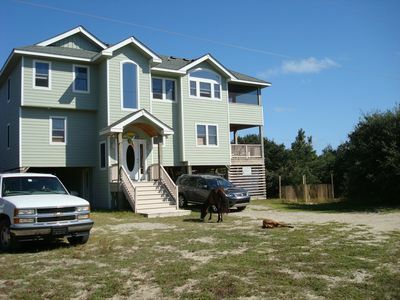 Inn Sea Sun, Water-Front Home, Carova Beach, NC. Eagle's Nest: Private pool, private hot tub, great community amenities. C5027 Brewer's Rest. 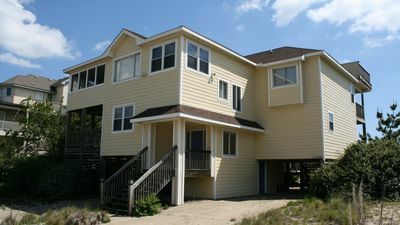 Pool, Pets Allowed, Rec Room, Beautifully Furnished!